Ping sites are essential for every blogger to spread his content on the web. As you know it is important for you to create high quality contents on your site. In addition, it is equally vital to present these contents to the world for their success. Here, ping sites or ping submission sites come for help. We will discuss some important points about ping submission sites in the below paragraphs. Are these sites really helpful? Before we talk about ping sites, let us know what a ping is. In technical terms, ping is a network tool to check the connection between two computers. For example, you can ping Google server to know if your computer has a connection with it (or not). A reply from Google will confirm the connection. But, ping sites have a bit different meaning in SEO. Ping sites are those websites which inform the various search engines and directories that there is a new update on your site. And, they should index your content. So, when you create new content or update an existing one, you want the search engines and other sites to know about this activity. When you create a new post you can manually submit to 3 or 4 search engines for indexing. But, the ping submission sites submit your blog post to many search engines and directories for indexing. If your website contents are not indexed then they will not exist in the eyes of the search engines. And you will not get organic traffic for these web pages. Now take the case of back links. As per studies, 70% or more back links are not indexed. It means time and efforts went into building those links is pure waste. Therefore, when you build a back link, you should not forget to submit it to ping sites for indexing. More indexed back links will improve your site SEO. Whereas your blog post indexing will get a chance to compete with other contents on the web. So, you should make it a practice to submit your contents and back links to the ping sites for indexing. You should pay attention to all the instructions mentioned on the ping submission sites. Then, fill out all the needed details like your site URL, title, keywords, etc. 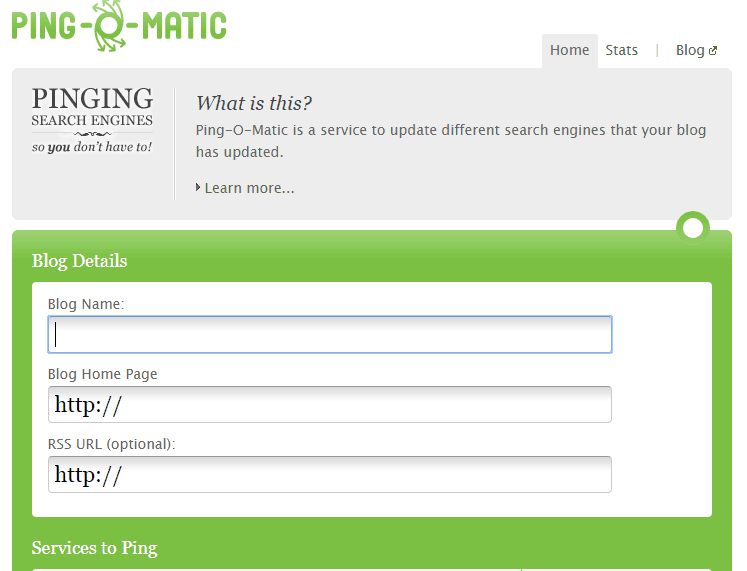 Ping-o-matic is a trusted site to ping website URL. There is no restriction on how many times you ping your website in a day. But, the normal practice is to ping website URL only once. In case, you ping your site multiple times a day with the same content, then some of the directory services may block your site. So, when you have a good tool at your hand, make a just use of it. Some SEO experts suggest submitting the recently created or updated contents to 2 – 3 ping sites a day. Then, you can repeat this process with the other two three sites after say, one week. This way, your contents and back links will get indexed by most of the relevant sites and search engines. As an important note, you can work with the top twenty ping sites to spread your content all over the internet. By now you have gained all the needed knowledge to use ping sites. In the beginning, go slow and use only 2 to 3 sites a day for indexing. It will be a good idea to use the top sites only. Do not forget to submit back links also for indexing. I am confident that this way of indexing will raise your SEO. As a result, your site position in the SERP(s) will improve. If you have something to add on this topic, please feel free to write in the comment section. Please subscribe to our email newsletter for interesting and useful stuff. Thanks for the nice list of Ping sites. This post is very informative. Thanks a lot for the high DA ping sites. It is a very useful information. This article is really helpful, it has helped me a lot to increase my business’s visibility. Great Information Sir. Thanks For sharing this valuable information. Keep up the good work. 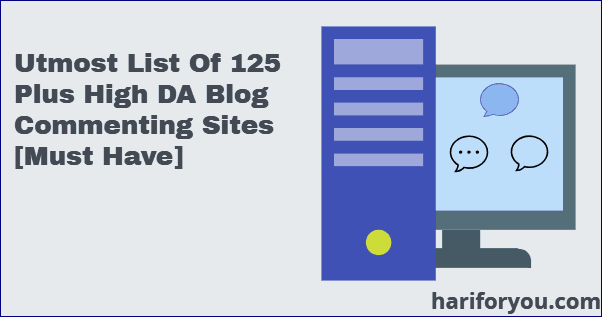 Hi, very good article on high DA Ping sites list. These sites help spread the content on the web. Very good article. Thanks for sharing keep of the good work. Thanks a lot for the high DA ping sites.These site is a helping spread the content on the web. The way you presented this list of Ping Submission sites are very appreciable. This is such a perfect list of Ping Submission sites. Ping Submission sites is a good way to promote our/your business.Thanks for sharing….!!! !